Welcome to the Caterpillar complaints department brought to you by HissingKitty. Experienced poor customer service? We make it easy to file a formal complaint against Caterpillar online. Simply use our free form and your feedback will be instantly forwarded for review. Need to contact the Caterpillar corporate office? We have the mailing address, phone number, and email address listed below. 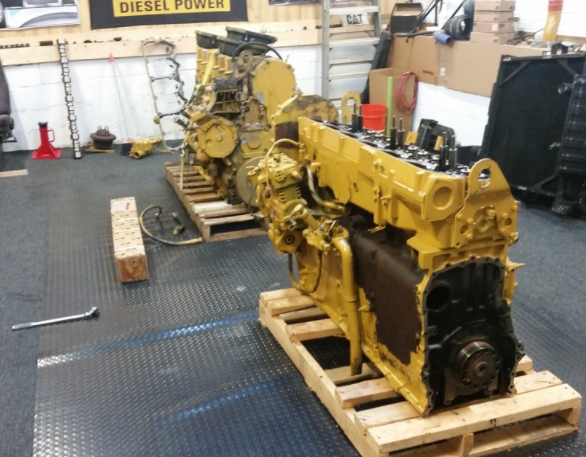 Hastings Deering Queensland has installed a new Caterpillar parts system and have taken it from very good to very poor costing all of us time and money. Very frustrating experience with this brand. Please fix it immediately. Had 2003 6nz rebuilt at cat in Yakima wash, 50,000 miles losing antifreeze. I can't find a leak, took it to cat Greensboro NC, home for me. They checked everything could not find leak, tore motor down, including liners, charged 10,000 dollars, replaced head, thought that might be problem. Three thousand miles put three gallons of antifreeze in. Found leak in bottom of radiator, thats what we paid cat to find. I thought you pay big bucks for professional work. Had to put radiator in. We don't think we were done right. We purchased a new 545 d skidder in January 2015 we are a small logging crew just starting out and we had faith in cat enough to try this machine because cat has just always lead the industry in a lot of ways and thought we would try it. Well this has been the toughest year I have ever been through I have numerous problems with this skidder over and over and have not really had much help from my salesman or my dealer I stopped counting at the end of the summer how many days we had been down just because of this skidder and it was 40 complete days then it's prob almost 80 now in a years time we normally average 7k to 10k dollars a day so that's a lot of money. I've lost just because of the skidder and it was all the machine I've tried talking to my salesman but they just brush us off I paid 320000.00 dollars for this machine a year ago and it broke down last week on Monday and I took it to the shop they said 2 weeks well it just rained us out one week but I know we can't control the weather but now 2 more weeks with no income it's just been one thing after another with it. I called my salesman and said will u buy it back he said I'll give you 190000k for it the machine has 1650 hours on it so in 13 months I ve lost 130000.00 plus all my down time so I'm in bad shape I'm gonna let my salesman have the machine for that price because I have to go back to work Monday. I will have to purchase what I can get for that amount but I just think somebody needs to know y'all have a problem with the d model skidder and it has just about bankrupt me and I had no help from my dealer at all hardly and not even offered a rental but once I mean I'm truly discusted in the name cat as big of an icon as y'all are I am truly let down and really feel like I've been cheated this is not right and I'm gonna strive to get to the bottom of it unless cat can try to work with me on this situation. I have quite a few Caterpillar complaints. I starts with the fuel pump, chassis cracking, rail cracking, and the vehicle not getting good gas mileage. Also the front bucket is not in working condition. 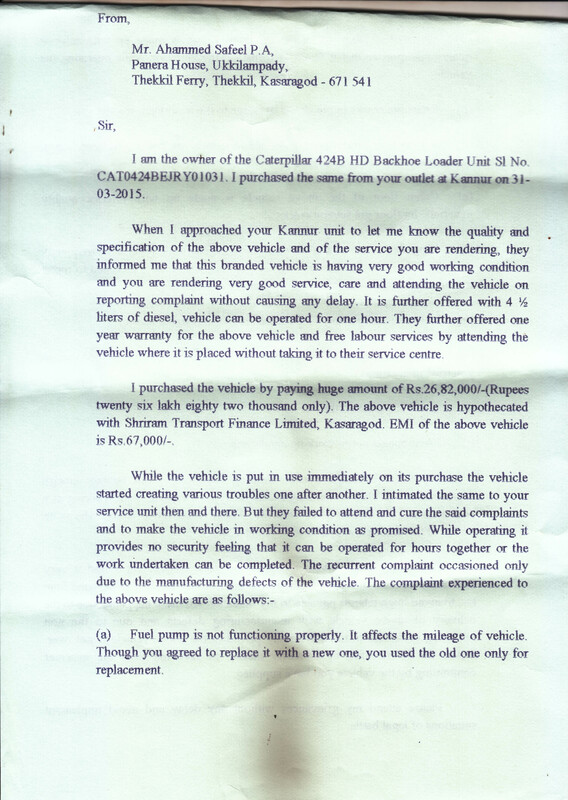 Attached is my letter about the 424B HD Backhoe Loader. I am not getting service that I expected from Caterpillar. Renting several items, I expected to have wonderful customer service. This is simply not the case. I use Caterpillar products for my construction company. They have great machines and excellent customer service that puts my mind at ease. We had a big ice storm hit and my Caterpillar was able to scrape the ice off the parking lot of my business, enabling customers and my employees to come and go without being in danger. Used this company all my 25 years of owning my own business and will use them for the next 25. I planned to start up an industry of marketing trucks, and I found the best manufacturer, Caterpillar. Latest technology, excellent materials, best engines and amazing support is given by Caterpillar. It is the largest industrial & capital goods provider in Automobiles, Attachments and Power systems. They manufacture trucks, blades, brooms, compact wheel loaders, excavators, mining shovels, skid steer loaders, planers, compactors, Marine & Power systems, Oil & Natural gas engines, Health care, Financing & Insurance products. If you have a plan to start up your business in any of the mentioned fields, please choose Caterpillar for excellent services and better quality products.